Running the Repair Service in a multi-datacenter environment requires using the NetworkTopologyStrategy. Running the Repair Service in a multi-datacenter environment requires using the NetworkTopologyStrategy. The OpsCenter keyspace defaults to SimpleStrategy. 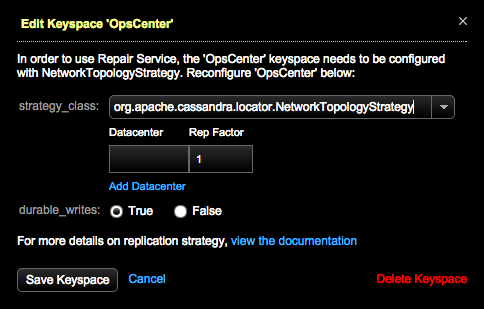 The Repair Service will not run with SimpleStrategy replication. Prompts guide changing the keyspace to a compatible replication strategy. The Edit Keyspace keyspace_name dialog for the keyspace appears. The dialog also appears if you attempt to start the Repair Service despite the warning. Be careful setting the durable writes option. When set to False, data written to the keyspace bypasses the commit log, which could cause data loss. If there are multiple incompatible keyspaces, the Error: Incompatible Keyspace dialog appears after clicking Configure for the Repair Service. 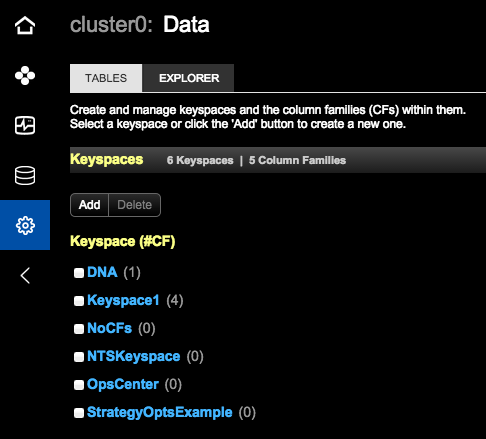 Click the Data section link to jump directly to the Data section to edit the keyspaces. Repeat the above steps as necessary until all keyspace warnings disappear.